I thought I’d be satisfied with my first visit, but then, hell, I want more! The place, the staff and specially the food were all perfect. So without any hesitation, I took my Tita Zeny, who was celebrating her birthday that day, my cousin Macky and his wife Hazel to this place now I call the oasis in the heart of Ortigas Center, The Texas Roadhouse Grill. Since I was quite familiar with their menu, I was the first one who ordered, and I had this Loaded Meatloaf. 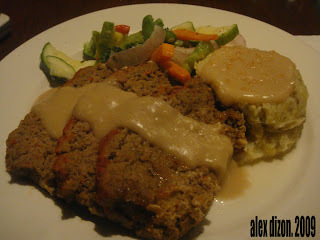 A plate filled with mixed vegetables, mashed potato and three thick slices of meat loaf. Let me start with the vegetables. The vegetable were cooked really well. By the time it arrived on our table, and by the time I sunk in my fangs, the vegetables were still crunchy and juicy. Really, really good. Just the way I want my vegetables cooked. But I think if you want your veggies cooked differently, you can suggest that to them and they’ll gladly the best dish that you want. On the other side of the plate, the mash potato is heavenly good! I love the texture when it melted on my mouth. And the gravy, the gravy is really delicious. So tasteful that with just first two dishes I’m already wowed. And finally, the meat loaf. Well, it was my first time to eat a meat loaf which looked like that. I mean, I was used to the meat loaf which was in can, and in fairness to this meat loaf, it just simply made me love meat loaf more. The soft meat which when eaten with mash potato and some of that veggies was apparently one complete very tasteful meal. 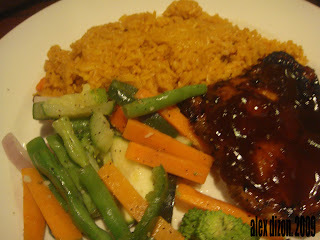 I was amazed that this meal made me bloated and still craving for more. Meanwhile, my Tita Zeny ordered a Geronimo Seafood Pasta Marinara. My Tita Zeny who loves pasta was speechless! She loved it! According to her, the flavour and the aroma was not that strong, unlike some of the pasta marinara we had before. The flavour was so fascinating and intriguing to her taste buds. 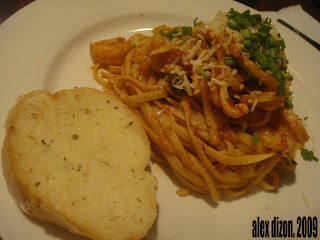 One flavourful pasta the filled the stomach of a happy birthday celebrant. And as to my say about this dish, it smelled so good. How I wish I could have two dishes that night. Lols! On the other hand, my cousin Macky ordered an ‘Ol Texas Burger and his wife ordered a Boneless Barbeque Chicken. According to my cousin, the buuuuuurger, (the right way to pronounce it because it was so big) is really yummy. The burger and fries totally stuffed a one very hungry man’s stomach. Actually, in less than 2 minutes he was already finished with his burger. And I can say that he was satisfied because he has a very big smile plastered on his face. While Hazel, who was pregnant, was also satisfied with her dish. She kept on saying that the chicken barbeque was really, really delicious. The sweet flavour of the sauce combined with the taste of the marinated chicken with char was really awesome. At first, when I saw what she ordered I thought she couldn’t finish it all, but I was wrong. Thank God she liked it! Honestly, I’m afraid that the food in this place might upset her stomach since she was in her 2nd quarter of her pregnancy. Amazingly, she love, love, love it! Oh, I’m not insisting you all to go here, but if you have extra money and wanna try something heavy and different and just wanna give your hard-earned money a good value drop by ASAP. I’m sure you’ll love it as much as we loved it!